In this very rare image, we see Douglass near the time of his escape. With the encouragement of Anna Murray, a free black woman living in Baltimore, Douglass disguised himself as a sailor and escaped to freedom on a train on September 3, 1838. This portrait was taken soon after, likely in 1840, and took advantage of the new technology of photography (invented in 1838). 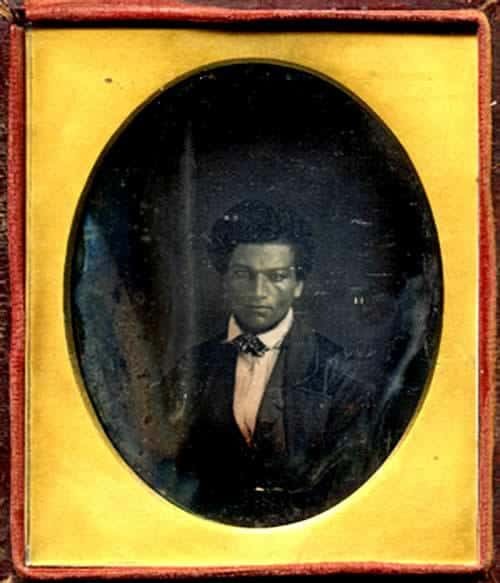 His intense gaze seems to penetrate the viewer; his direct focus on the camera itself is a distinct visual characteristic very different than his later portraits (which most often picture Douglass looking to the left of the camera). Douglass’s passion for the abolitionist cause, one he took into his own hands when he took his freedom, exudes from his powerful gaze. While his youthful face reveals his young age, Douglass’s careful construction of his refined appearance and intense demeanor speak to his determination to become a national figure in the fight against slavery.